Democracy demands an independent news media free of government interference. But recently, journalists have been the subject of surveillance in the government’s pursuit of whistle blowers. Through intimidation and harsh prosecution, officials are attempting to silence those voices brave enough to speak up about government wrongdoing. We know that our country has real and serious national security concerns, but we strongly believe authorities have crossed the line by targeting journalists. We are preparing to send a letter to the White House and Department of Justice asking President Obama and Attorney General Eric Holder to stop and renounce their actions threatening America’s free press. Please join with us by signing the letter, and by adding your own comments as desired. 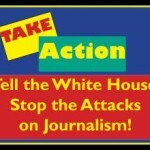 Dear President Obama and Attorney General Holder,We are deeply concerned about the future of journalism in our democracy. That means that there must be protections to allow for the vibrancy of reporting that is necessary. No administration will like all of what is reported, as a functioning press must be independent and able to question all aspects of our society.Some of us are members of The Newspaper Guild-CWA, the union representing U.S. journalists, and some of us are part of the larger community. We believe there has been substantial interference with journalists, and also pressure on and against whistle blowers. Your administration has been very aggressive in surveilling journalists’ phone records. At least one reporter has had his movements tracked. Using subpoena power, you are attempting to force one of our own Newspaper Guild members, the New York Times’ James Risen, to reveal the source of a leak. Your actions suggest you will stop at nothing and prosecute without mercy. Britain detained the partner of journalist Glenn Greenwald with your administration’s knowledge and you did nothing. British authorities seized and destroyed hard drives and other electronics belonging to The Guardian newspaper, and you did not speak against it. These corrosive actions, and inactions have a dangerous ripple effect. As the federal government becomes less transparent and more hostile toward the media, so too have state and local governments. Public records are being restricted; photojournalists are routinely arrested. 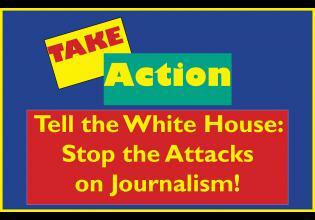 If these attacks on journalism aren’t stopped, they will escalate. Tracking, threatening and arresting journalists are the tools and actions once known only in totalitarian states. It is upsetting to think they will become the new normal in the United States. Our democracy can’t survive that nightmare. We implore you to stop these actions NOW. Renounce them publicly. Affirm the vital role of a free press in a free society.